The Federal Communications Commission (FCC) provides the following information regarding Voice over Internet Protocol (VoIP). For the latest information, go to the fcc.gov website. 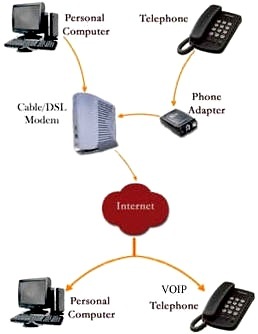 Voice over Internet Protocol (VoIP) is a technology for communicating using “Internet protocol” instead of traditional analog systems. Some VoIP services need only a regular phone connection, while others allow you to make telephone calls using an Internet connection instead. Some VoIP services may allow you only to call other people using the same service, but others may allow you to call any telephone number - including local, long distance, wireless, and international numbers. VoIP converts the voice signal from your telephone into a digital signal that can travel over the Internet. If you are calling a regular telephone number, the signal is then converted back at the other end. Depending on the type of VoIP service, you can make a VoIP call from a computer, a special VoIP phone, or a traditional phone with or without an adapter. In addition, new wireless "hot spots" in public locations such as airports, parks, and cafes allow you to connect to the Internet, and may enable you to use VoIP service wirelessly. If your VoIP service provider assigns you a regular telephone number, then you can receive calls from regular telephones that don’t need special equipment, and most likely you’ll be able to dial just as you always have. You may need an Internet connection, and, for many types of VoIP calls, you need a broadband Internet connection. For information on broadband Internet connections, visit www.fcc.gov/cgb/broadband.html. Depending on the VoIP service you purchase, you may need a computer, a special VoIP telephone, or a regular telephone with an adapter. If you are calling a regular telephone number, the person you are calling does not need any special equipment, just a telephone. If you use a VoIP telephone or regular telephone, you place and receive calls much like you do with regular telephone service. If you use VoIP with your computer, a telephone icon usually appears on your computer screen. Clicking the icon allows you to dial numbers from a pad, or dial a call by clicking on a contact’s pre-programmed name and number. You will then hear a ring just like any other call. Computer-based VoIP services have a variety of ways for notifying you that you have an incoming call. VoIP may offer features and services that are not available with more traditional telephone services. If you use VoIP, you can decide whether to pay the cost of keeping your regular telephone service. You can also use your computer and VoIP service at the same time. You can also take some VoIP services with you when you travel and use them via an Internet connection. Are There Special Considerations for Using VoIP? Some VoIP service providers may have limitations to their 911 service. For more information on VoIP and 911 services, visit the FCC’s VoIP 911 Web site at www.voip911.gov, or see the FCC’s consumer advisory at www.fcc.gov/cgb/consumerfacts/voip911.html. Some VoIP services don’t work during power outages and the service provider may not offer backup power. These factors may change with new developments in VoIP technology. You should always check with potential VoIP service providers to confirm any limitations to their service, including 911 service. With VoIP, Is There a Difference Between Making a Local Call and a Long Distance Call? Some VoIP providers do not charge for calls to other subscribers to the service. Some VoIP providers charge for a long distance call to a number outside your calling area, similar to existing, traditional wireline telephone service. Other VoIP providers permit you to call anywhere at a flat rate for a fixed number of minutes. Your VoIP provider may permit you to select an area code for your VoIP service that is different from the area code in which you live. Calls within your VoIP area code may not be billed as long distance calls. People calling your VoIP area code from another area code, however, may incur long distance charges. The FCC has worked to create an environment promoting competition and innovation to benefit consumers and, where necessary, has acted to ensure that VoIP providers comply with important public safety requirements and public policy goals. The FCC requires interconnected VoIP providers and telephone companies that obtain numbers for them to comply with Local Number Portability (LNP) rules. Beginning in late summer 2010, VoIP providers, as well as wireless and wireline providers, must shorten the porting period for “simple” ports from the current four days to one business day. The new deadline applies to all simple ports – including “intermodal” ports such as wireline to wireless, wireless to wireline, wireline or wireless to VoIP, or any other combination. Simple ports generally do not involve more than one line or more complex adjustments to telephone switching equipment. VoIP providers must also contribute to funds established to share LNP and numbering administration costs among all telecommunications providers benefiting from these services. For more information regarding the FCC’s LNP requirements, see the FCC’s consumer fact sheet at www.fcc.gov/cgb/consumerfacts/numbport.html. The FCC also limits interconnected VoIP providers' use of customer proprietary network information (CPNI) such as your telephone calling records, and requires interconnected VoIP providers to protect it from disclosure. For more information on these limits and requirements, see the FCC’s consumer fact sheet at www.fcc.gov/cgb/consumerfacts/phoneaboutyou.html. The FCC also requires interconnected VoIP providers to contribute to the Universal Service Fund, which supports communications services in high-cost areas and for income-eligible telephone subscribers. Interconnected VoIP providers must comply with the Commission's Telecommunications Relay Services (TRS) requirements, including contributing to the TRS Fund used to support the provision of telecommunications services to persons with speech or hearing disabilities, and offering 711 abbreviated dialing for access to relay services. Interconnected VoIP providers and equipment manufacturers also must ensure that, consistent with Section 255 of the Communications Act, their services are available to and usable by individuals with disabilities, if such access is readily achievable. For more information about Section 255 requirements, see the FCC’s consumer fact sheet at www.fcc.gov/cgb/consumerfacts/section255.html. the details of your complaint and any additional relevant information. For more information about VoIP, visit the FCC's VoIP Web page at www.fcc.gov/voip/. For information about other telecommunications issues, visit the FCC's Consumer & Governmental Affairs Bureau Web site at www.fcc.gov/cgb, or contact the FCC's Consumer Center using the information provided for filing a complaint. For this or any other consumer publication in an accessible format (electronic ASCII text, Braille, large print, or audio) please write or call us at the address or phone number below, or send an e-mail to FCC504@fcc.gov. To receive information on this and other FCC consumer topics through the Commission's electronic subscriber service, visit www.fcc.gov/cgb/contacts/. This document is for consumer education purposes only and is not intended to affect any proceeding or cases involving this subject matter or related issues.